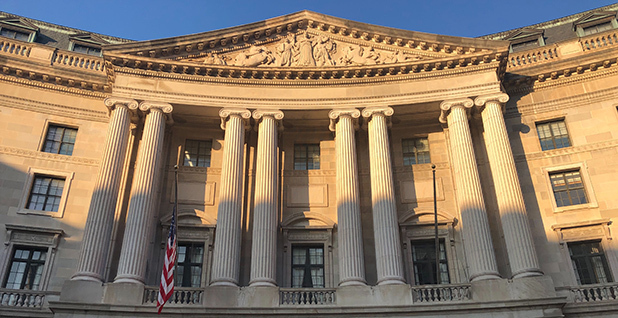 What would normally be a sleepy holiday workweek at EPA headquarters seemed oddly significant today as the agency remained open while others were shuttered during a partial government shutdown. Acting EPA Administrator Andrew Wheeler told staff in an internal email that they should report for work as usual this week, which was already shortened by federal holidays on Christmas Eve and Christmas. EPA will keep up operations using carryover funds for a limited period of time. EPA employees told E&E News they expect many offices will be empty anyway since colleagues are on vacation. Still, they seem resigned that they too could be facing furloughs if Congress and President Trump don't agree on new funding soon. "We have been through this before," one EPA employee said. "I feel discouraged that two years into this administration, this is the best our government can do for us." This is the third government shutdown under President Trump. EPA also used carryover funds to keep up operations for the prior two lapses in appropriations under this administration. At least one part of EPA remains closed. The Office of Inspector General posted a notice online that it would be shut down, except for its complaint hotline and some law enforcement functions. "While the EPA has announced that most of its offices will be open for a limited amount of time, the OIG is independent of the agency and has a separate appropriation. We have determined that, absent an appropriation or continuing resolution, we must shut down," said the IG on its website. An IG spokeswoman said last week that about 249 employees in the watchdog office could be furloughed (Greenwire, Dec. 21). Others elsewhere in the federal government have also shut down. Overall, about 400,000 federal employees are estimated to be furloughed during this partial shutdown. EPA employees said they expected to receive their paychecks this Friday. But if the shutdown extends longer than that, it could affect their future pay. "Luckily, our mortgage is paid for January, and we'll get a check this Friday — after that, we panic," said one EPA employee. "I'm sure we'll get our back pay, but it's such a pain to have to call creditors and try and explain what is going on." Others seem worried as well. In an online survey of its federal employee members taken after the shutdown, the National Treasury Employees Union found that more than 78 percent were "very concerned" about how the funding lapse would affect their ability to pay their bills, rent or mortgage and other basic living expenses. Nearly 1,600 members responded to the survey, the union said. Mike Mikulka, president of American Federation of Government Employees Local 704, said EPA employees are concerned about their pay next year. "Most did not want to face another shutdown around the holidays, putting a damper on everyone's mood and creating uncertainty about when the shutdown would end and if we would lose pay in the new year," said Mikulka, whose union represents EPA Region 5 employees in the agency's Chicago office. In his email, Wheeler said the agency would update staff on EPA operations this Friday. Several employees expect that is when EPA will run out of leftover funds and have to shut down. That could mean more than 13,000 agency employees would have to stay home while roughly 700 would have to come to work under EPA's shutdown plan. Both sets of workers would be unpaid. "Most people are prepared for a furlough situation at least early next week. I think folks are bracing for that. The sentiment is we will be furloughed starting Monday," said Jeanne Schulze, president of AFGE Local 1003, whose union represents Region 6 employees in EPA's Dallas office. Funding for several federal agencies ran out last Friday. The Senate last week had passed a short-term spending measure to keep all of the government open, but the House moved that legislation along with $5 billion for a border wall, a key campaign promise for President Trump. Trump has said the government will remain shut down until Congress approves border wall funding. Speaking to reporters in the Oval Office yesterday on Christmas, the president said the border wall has the support of federal employees (see related story). "Many of those workers have said to me, communicated, 'Stay out until you get the funding for the wall.' These federal workers want the wall," Trump said. That puzzled if not angered EPA employees. "Huh? Who said that?" one said. Another said colleagues at EPA thought Trump's sentiment was "disgraceful." "How dare he say government workers want the shutdown and the wall," that employee said. It seems likely the funding impasse won't be resolved this week. Office of Management and Budget Director Mick Mulvaney, who is also Trump's incoming White House chief of staff, said he envisions the shutdown will last into January. "It's very possible that the shutdown will be on the 28th and into the new Congress," Mulvaney said on Fox News Sunday. One EPA employee said it was a strange time for a shutdown, considering so many federal workers are off for the holidays. That could hinder an orderly closure of the agency once it runs out of carryover funds. "If we stay shutdown next week, it will be tricky because so many people are off that running the shutdown scenario will not be so straightforward," an EPA employee said. Schulze said the furloughs would come at a tough time. "It can cause a lot of stress for federal workers," she said. "It couldn't come at a worse time, right after Christmas. Bills could be coming due if we are furloughed."